We start school the Tuesday after Labor Day- and I am so excited to start teaching again! There are so many new things I want to try this year, among them more proficiency based assessments. Before I delve into that world- let’s start with the first day of school! This is such an important lesson for us language teachers- students taking language for the first time have no idea what to expect and may come in thinking the worst things! 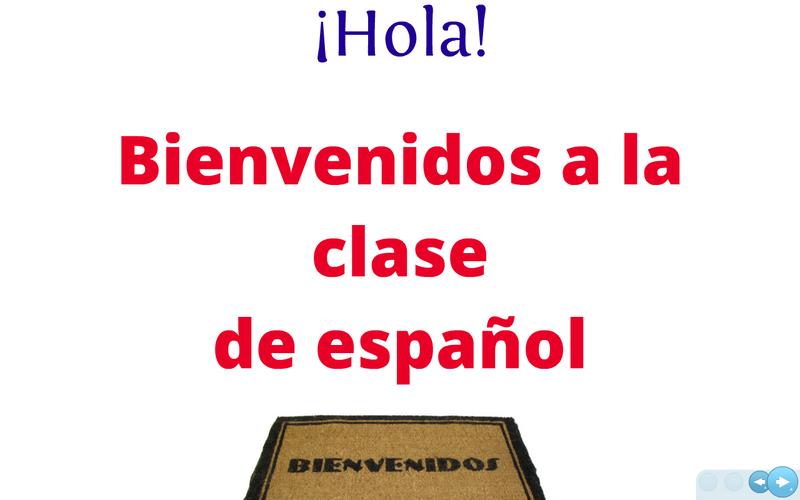 I always try to make this lesson a lot of fun and of course filled with a lot of Spanish! In years past I have showed them a Power Point that talked a little bit about me and the class but this year I decided to transfer that PPT to a prezi. If you’re not familiar with Prezi, it’s like a 3D moving Power Point! It’s pretty cool and easy to use- and best of all the students love it! I started using it last year but plan to make most of my presentations here this year. My plan is to show the students the presentation – and speak 100% in Spanish. The point of this is to get the students thinking about strategies they can use as language learners to figure out what I am saying. I always emphasize that they don’t need to understand everything I say word for word- just the big picture. As part of this introduction I also have the students introduce themselves in Spanish after I have modeled for them several times. The prezi just has some basic information about me, my likes and dislikes and pictures of my family. I try to use a lof of cognates and pictures and body gestures and I tell them that as language learners these are things that they need to focus on to try to get the most out of what they are listening to. Even if you don’t use a Power Point or Prezi- use props or pictures, move around, point to things- they will get it- don’t be afraid to use the target language! I previously taught in an immersion program before this position and from a cart- no Prezis or Power Point for visuals- just me and the pictures and the students learned just as much as when I teach 50/50. So push yourself to get to at least 90%! This lesson is shortened on this day because of a special first day schedule, but our talk about strategies won’t end today! It’s a perfect segway to our next lesson on cognates- stay tuned! Here is a snapshot of my prezi 🙂 Kudos to Creative Language for the Prezi inspiration! What types of things do you do on the first day? ← Get your students motivated and participating! Muchisimas Gracias! This was extremely helpful!